Materials such as solid foams, highly-porous cohesive granulates, for aerogels possess a mode of failure not available to other solids. cracks may form and propagate even under compressive loads (‘anticracks’, ‘compaction bands’) , , . This can lead to counter-intuitive modes of failure – for instance, brittle solid foams under compressive loading may deform in a quasi-plastic manner by gradual accumulation of damage (uncorrelated cell wall failure), but fail catastrophically under the same loading conditions once stress concentrations trigger anticrack propagation which destroys cohesion along a continuous fracture plane. Even more complex failure patterns may be observed in cohesive granulates if cohesion is restored over time by thermodynamically driven processes (sintering, adhesive aging of newly formed contacts), leading to repeated formation and propagation of zones of localized damage and complex spatio-temporal patterns as observed in sandstone , cereal packs , or snow . We study failure processes associated with volumetric compaction in porous materials and develop micromechanical models of deformation and failure in the discrete, porous microstructures. We then make a scale transition to a continuum model which we parameterise using the discrete simulation results. We adopt a multi-scale approach analogous to P8 where first, in a mesomechanical model, stress-controlled local failure processes (modelling in collaboration with P4) as well as (where applicable) aging processes such as sintering are described with full resolution of the geometry of the porous microstructure. Initial microstructures are taken from CT scans  provided by external partners (Geosciences@Edinburgh for porous rocks , WSL-SLF for snow ). We then make a transition to a macro-scale continuum model where local failures are represented in terms of damage variables, using a framework which accounts for the characteristic length scale of the pore microstructure. This model will be parameterized based upon simulations of the mesomechanical model and used to model both compressive failure and, in conjunction with aging models, the complex dynamic patterns that emerge from the interplay of local brittle failure and subsequent aging (collaboration with P9 for implementation). P. Baud, E. Klein und T. fong Wong, „Compaction localization in porous sandstones: spatial evolution of damage and acoustic emission activity,“ Journal of Structural Geology , Bd. 26, Nr. 4, pp. 603-624, 2004. 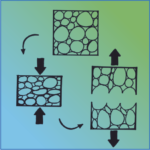 F. Guillard, P. Golshan, L. Shen, J. R. Valdes and I. Einav, “Dynamic patterns of compaction in brittle porous media,” Nature Physics, 2015. J. Heierli, P. Gumbsch und M. Zaiser, „Anticrack Nucleation as Triggering Mechanism for Snow Slab Avalanches,“ Science, Bd. 321, Nr. 5886, pp. 240-243, 2008. P. Hagenmuller, T. C. Theile und M. Schneebeli, „Numerical simulation of microstructural damage and tensile strength of snow,“ Geophysical Research Letters, Bd. 41, Nr. 1, pp. 86-89, 2014. F. Fusseis, X. Xiao, C. Schrank und F. D. Carlo, „A brief guide to synchrotron radiation-based microtomography in (structural) geology and rock mechanics,“ Journal of Structural Geology , Bd. 65, pp. 1-16, 2014.